Last week I received a text message instructing me to be in the forecourt of St Leonard’s Church, Shoreditch High Street, at 6:20pm on Friday. “Please remember to bring cash, ID and warm clothes”, the message read. I wasn't sure how seriously to take these instructions, but I put my provisional driving licence in my wallet and headed for the designated location. I counted fifty people in the churchyard. Eventually, we were divided into small groups and guided silently to a railway arch on the other side of Kingsland Road. The railway arch had been transformed into a stage set by the Belarus Free Theatre (BFT) for a performance of Discover Love, a staple of their repertoire. 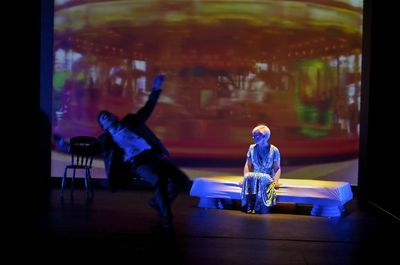 The show is just one of eleven individual productions being staged during a two-week celebration – “Staging a Revolution” – of the tenth anniversary of the Belarus Free Theatre. The celebration began with a week of performances and discussions at undisclosed locations in London and concludes with a week of shows at the Young Vic, where the group have been an associate company since they were granted political asylum in the UK in 2011. The show was introduced by the BFT co-founder Natalia Kaliada, who gently admonished us for not bringing our passports; attending a BFT production in Belarus is a serious business and, if you are detained by the authorities, having your passport to hand means fewer hours in custody. We were then introduced via Skype to our Belarusian counterparts, who were watching events unfold from Minsk. Discover Love tells the true story of Irina Krasovskaya and her husband Anatoly, a successful businessman. It begins as a traditional love story detailing their courtship and marriage and the difficult early years when they struggled to bring up their daughter in economically and politically uncertain times. Their support for each other is unerring. The action unfolds as a series of playful vignettes that are gradually darkened by the tragedy that befalls the couple. The world that surrounds Irina is revealed as one of horror, brutality and deceit. One day in 1999, Anatoly told his wife that he would be spending the evening with some friends and that he would be home later that night. Irina never saw her husband again. After the performance, beetroot soup was served and some of the audience sat cross-legged on the stage supping from paper bowls. The discussion that followed, however, was sobering. The topic was “the problems of forgiving and forgetting”, and Irina Krasovskaya herself was in attendance to add to the account of her experience that we had just watched. Anatoly Krasovskaya’s car was discovered but his body has never been found, and his name has simply been added to the ever-growing list of “the disappeared”. (It is noteworthy that the UK is one of the few Western European governments not to sign the UN Convention Against Enforced Disappearances.) For the talk Irina was paired with Marina Cantacuzina, the founder of The Forgiveness Project; the chair was BBC Scotland’s Kaye Adams, who mediated between the speakers and an audience who were still very much trying to process what they had just seen. It became apparent that “forgiveness needs a face”: in order for the victim to forgive, the perpetrators of the crime must be brought to justice; the men accused of murdering Anatoly Krasovskaya never were. Talk turned to artistic intention, and whether a piece of theatre can effect any kind of immediate change. Much has been made in the past few years of theatre in London being “immersive” and “experiential” in ways that are largely arbitrary. Watching the nightmare that one woman experienced, and having that horror compounded by the presence of the individual who suffered it, was about as real and visceral as theatre can get. To support the Belarus Free Theatre, visit www.belarusfreetheatre.com.